This new steampunk adventure is a race around the world. Tim Barnabas is a submariner from the Cuttlefish, a coal fired submarine. Clara Calland is the daughter of a scientist who carries a secret formula that threatens British Imperial power. After a daring chase across the globe, they have brought the secret to Westralia. Here, much of Australia is simply too hot to be habitable by day. People are nocturnal, living underground and working outside at night. 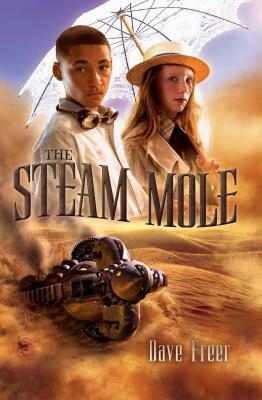 To cross the deserts they use burrowing machines know as "steam moles." With the Cuttlefish out of action, her crew takes jobs on these submarine-like craft. Duke Malcolm, of the Imperial Security Service, transports Clara's rebel-father to a prison in Eastern Australia, hoping to bait her into attempting a rescue. Clara looks to Tim for help, only to find he has fled a racist incident into the desert. She takes a steam mole in search of him. The two head to Eastern Australia, where they discover an invading force with plans to take Westralia. Forced to survive in the desert, they encounter the intolerance meted out to the aboriginal people. Can they save Westralia from falling under British rule? And should they?" Dave Freer is an ichthyologist turned author. He lives on Flinders Island, between Australia and Tasmania, with his wife, Barbara; four dogs; four cats; and two sons, Paddy and James. His first book, The Forlorn, came out in 1999. He has coauthored novels with Eric Flint and with Mercedes Lackey, as well as written A Mankind Witch and Dragons Ring and various shorter works. Besides working as a fisheries scientist for the Western Cape shark fishery, he has worked as a commercial diver and as a relief chef at several luxury game lodges. His other interests are rock climbing, diving, fly-fishing, fly tying, wine tasting, and the smoking and salting of food. Visit him online at coalfiredcuttlefish.wordpress.com, at www.facebook.com/Freer.Dave, and on Twitter @davefreersf. "David Freer is an imaginative author who tells great stories." -Rebecca Moesta, New York Times-bestselling coauthor of Star Wars: Young Jedi Knights"